As the summer continues, our offices have the best airconditioners in Norway and Poland, so our developers have been in them, working to bring you Opera 17 Developer stream. This stream is our bleeding edge development; features will be piloted, and may be shelved, taken back to the drawing board, or taken forward to the Opera Next stream - feature complete, but potentially buggy. Once the bugs have been ironed out, the features are released as stable, and once every few weeks the streams are all refreshed. You can follow all three if you want, but please note that you shouldn't entrust valuable data to anything other than the released stable stream. So, what's new in Opera 17 Developer? Amongst the others, we have prioritized some of the things you have been asking for. Themes - you can now download themes for Opera. These are backwards compatible, so themes that worked in Opera 12 will work in Opera 17 Developer. Camera/mic - we've re-plumbed the web cam and microphone, so your getUserMedia fun is reinstated! This is not working on Mac correctly yet, but feel free to check it out on Windows. HiDPI Support (Windows) - for the ones running in hi-resolution on small screens, we are delivering you better pixels experience. As summer turns to autumn, we'll turn our attention to improved tabs handling: vertical tabs, visual tabs, tab cycler, move tabs between windows, quick access bar (aka bookmarks bar), synchronization.. We've planned further bookmarks enhancements, further synchronization development, site preferences, and more. (Hint: so please don't fill up the comments asking when they'll be released - the answer, as always, is "when they're ready". Like autumn berries, they need to be ripe before they're picked. Thanks for delivering Opera Dev 17 baby today ! We'll see that it grows beautifully. Blazej Kazmierczak, thanks! you made my day... though, I can't see anything for bookmarks yet and if I'm correct you mentioned that we may see it in 017. Installing https://addons.opera.com/en/themes/details/ibis-inspire-3/ crashes Opera. Themes that only change the wallpaper work. HiDPI Support (Windows) was enabled by default on my end, so I left it that way. in opera:flags you can see "quick access bar", that's where bookmarks are hidden for now. Good backend is already made, but UI is under construction still. First phase will be a bar, later something more advanced. I can only drag a pinned tab to the end of the tablist, not any other place. If I want to move it, I need to move the other (normal) tabs instead. Also Ctrl+tab / Ctrl+q seems to be dead again. The browser now develops in the right direction. I hope until version 20, tab-stacking will have its comeback. Pinned tabs can only be at the beginning of the tab list, normal only at the end (after pinned tabs). There is a bug when you have a single pinned tab, this bug has been fixed internally. I suspect that's the bug you're seeing. Is there a way to remove my search engines? I can't find a remove/delete button in the interface.
" improved tabs handling: vertical tabs"
One general query; Is Opera just using the webkit/blink rendering engine "as is" now? Or will Opera feed some improvements back into it? I am just curious. Opera used to do some stuff rendering-wise Chrome couldn't. Animated PNGs, for example. It would be nice if that returned. (honestly, I don't understand why the web still use's GIFs ). Another point: Default search settings should be editable/deletable too. I dont like bing and yahoo and would like to have the german wikipedia at 'w', not the english one (but browser language should still be english). I have no problems with bookmarks (although I already got used to Speed Dial + Stash), as I understand lots of people need it, but please, please, please, make it possible to disable bookmarks (at least, make it possible to hide the bookmarks quick access bar). Yay for lazy session loading! I'm starting to be confident with some good features coming back. But no news yet about Notes and M2/RSS and these are the main features for me. That's why it wasn't mentioned it in the blog post and why it is disabled by default. I hope there'll be an option to use bookmarks as button and drop-down list, like a "star" in 12.X. Yes I read the Blazej'z post later so I edited mine post to prevent more confusion Well I already cant wait for O17 stable Good work! Thanks for the update and the informations. Thant sound great all in all. I must admit, I was one of those who were against O15 and beyond. But this step (first O16 and now O17 with future features) let me think about it. 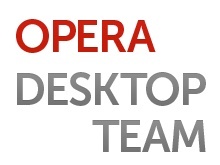 I see another shiny future of Opera, if you guys realy get the core-featrues back to us. As someone who does use bookmarks I don't want a bar taking unnecessary space of my screen neither. A button on the main toolbar is my wish. Exactly like I have it in 12.16. Anyway to import Profile data from Opera Next to Opera Dev builds? Would be really helpful in testing. "HiDPI Support (Windows) - for the ones running in hi-resolution on small screens, we are delivering you better pixels experience." Sounds interesting, can you give an example at which resolution this better pixel experience starts? For example I'm using an old, but good 17" TFT monitor with 1280x1024 pixels which is the reason why I have to zoom most web pages to different scales. I don't know the location on Macs. right click > Edit Site Preferences > Cookies (delete-edit) ? Try setting Windows to 125% or similar. You can also set a fixed zoom factor for all pages. HiDPI is still in progress, though. YES! Thank you! I'll be downloading this in a few minutes. A request from me: could you bring back the default down-up gesture to duplicate current tab? I use it quite often with back gesture to go back in a new tab. 1. Shift clicking on a link opens a New Window and not a New Tab... this is really Frustrating. click anywhere on the screen for the popup to Pop ! 6. the STOP Gesture (RMB + Upward) was really useful for me and I'm still wondering why you removed it... will it be back ? "Recently closed" does not show any closed tabs. Opera crashes when clicked on 'clear this setting' on address bar location icon. (BTW, why it should display itself on the address bar when it's already diabled???). Text (web address) in address bar seems to be placed downward and not in centre. Home button, UI customization, option to clear all data on exit. W8.1 Ent pre x64 USB install, no addons. Yes, your custom search engines can be removed. Open search engines manager -> hover mouse pointer over custom search engine, there should be X button on the right of it. They are disabled by default. Go to opera://flags, enable them, restart the browser and then you can go to addons.opera.com and download/install themes. It is not yet finished though, expect some bugs and (even) crashes. They are accessible from O menu -> Themes. Enable it in opera:flags first, then you'll see it on the Themes page. It's disabled by default until we've happy with its stability etc. I don't understand why you treat "rocker gestures" different from normal mouse gestures. I mean, If I disable the mouse gestures why do the "rockers" still work?? Will we get at least some kind of updates for old opera 12?Something like 12.17? Will we have an integrated torrent client like before? That's not a custom search engine, it looks like one of the default engines. I believe Amazon is not a custom search engine of yours, but instead a default search engine which cannot be removed? Showing comments 1 - 50 of 581.